The utility helps open a deal with a stop loss that does not exceed the specified amount, or to refrain from it altogether. That is, it determines the number of lots to open the deal so that the stop loss is as close as possible to the specified amount in USD without exceeding it. For example, it will be indispensable when trading according to the Gerchik strategy. That is, when trading based on risks, with a fixed risk and a fixed take profit relative to stop loss. For example, if you always open deals with a risk of 10 USD and a take profit of 30 USD (3 to 1), this utility will help you to easily determine the number of lots for opening the deal to meet the conditions. draw a line defined as the ratio of take profit to stop loss for partially closing the deal. The stop loss level can be specified both in USD and in percentage of the balance. You do not have to enter the market. Instead, you can simply track a number of lots necessary to open a trade and a take profit level. That data is displayed in the utility settings window after you set a stop loss price. Launch the utility on the chart where a deal is to be opened. It is necessary to specify one parameter - the stop loss level (Stop loss Price). It represents the price where the stop loss is to be set. This price can be set both manually by entering a value in the corresponding field, and by moving the red line created by the utility on the chart. Based on the stop loss level and other parameters, the utility determines the direction for opening a deal, the lot size, the order type for performing it (market or limit) and the take profit level. Loss in dollars or per cent for a stop line (STOP_IN) – amount in USD or in percentage of the balance that would be lost in case a stop loss is triggered (in USD by default). Choice of dimension for STOP_IN – select if the amount at risk for opening a trade is specified in USD or in percents of the balance. Do not open a trade if at min lot stop is greater than STOP_IN – if true, then a trade will not be opened in case the loss received at a stop loss exceeds the allowable risk (default is true). 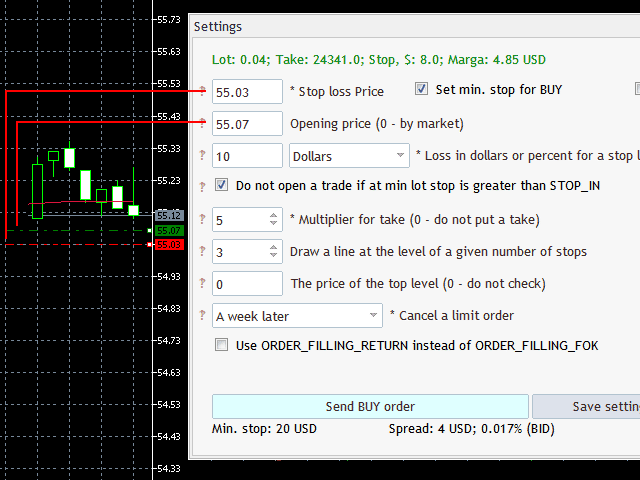 Opening price (0 - by market) – price for opening a trade (if > 0, then a limit order is sent, otherwise - order by market); this price can be set both manually by entering a value in the corresponding field, and by moving the green line created on the chart. 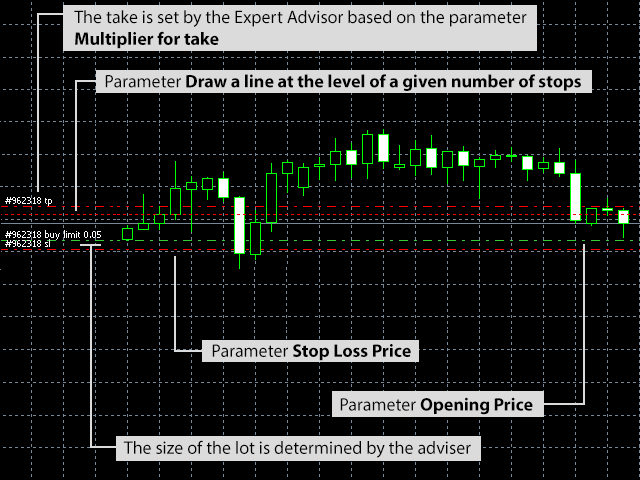 Multiplier for take – multiplier for determining the ratio of take profit to stop loss (default is 4, that is, reaching the take profit earns 4 times the possible loss when reaching the stop loss). 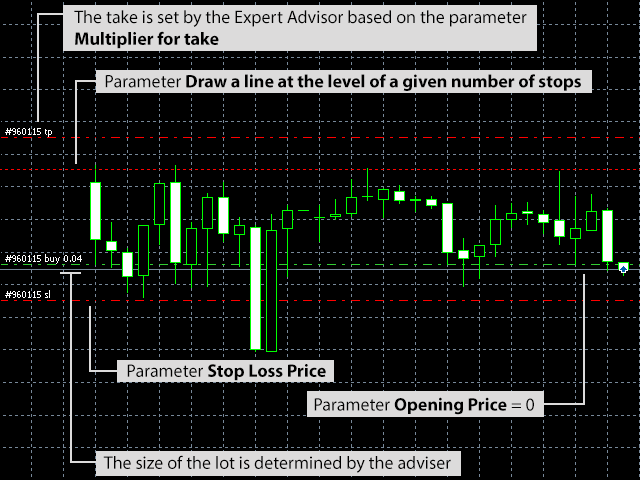 Draw a line at the level of a given number of stops – if greater than 0, a line will be drawn on the chart at the level of the specified multiplier relative to stop loss (default is 3, that is, the line will be drawn at the level of three stop losses from the opening price to the profit area). 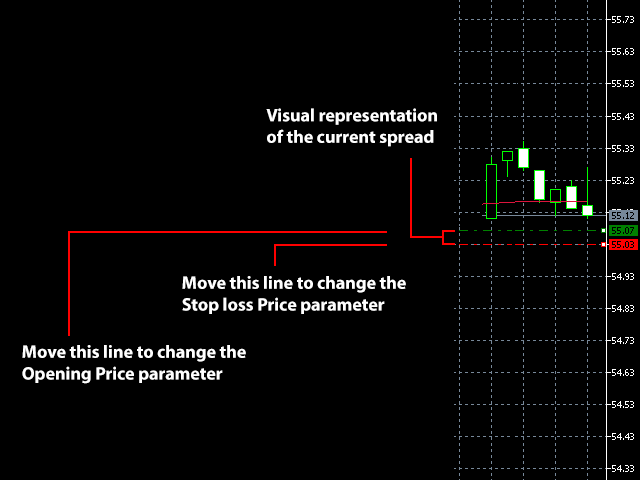 This line can be used for determining the price to partially close a trade, if you prefer closing trades gradually. The price of the top level (0 - do not check) – the maximum price for take profit (if take profit exceeds this price,, the order will not be created). That is, if an instrument is traded within a channel, and you are 99% certain that the price will not go above the channel, you can set a borderline price for the channel to ensure that the take profit does not exceed the channel with the selected multiplier. The demo version of the utility works on two symbols only. - добавлена возможность использования режима исполнения сделок ORDER_FILLING_IOC. - добавлено отображение линий, показывающих минимальный стоп лосс для ордеров в Long и Short (если для инструмента есть ограничение минимального стоп лосса). - добавлен флажок для увеличения количества пунктов мин. стопа на 3 при установке флажков "Уст. мин. стоп для BUY" и "Для SELL"
- Now, take profit level cannot be specified. If no take profit level is set, no take profit is placed when opening a position. - Current spread by symbol is now updated at each tick. - Apart from the current spread, the settings window also shows the type of the last price by symbol - Bid or Ask. - Removed the mode of withdrawing take profit without performing a trade. Instead, the utility now features the fields of the current take profit, stop size and the number of lots in real time mode. - The settings window buttons now display the operation type - Buy or Sell. - Added tooltips to the settings dialog window. 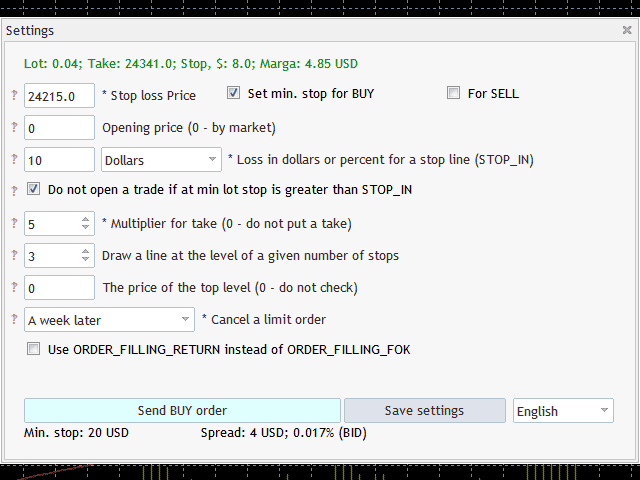 - Added the switch for minimum stop for Buy/Sell. - Added the button for saving the settings in the settings dialog window. - optimized the EA operation.